At dawn, Oct. 7, 1918, Battery E, 56th C. A. C., let go a salvo directly on the enemy's line north of the Argonne Forest. 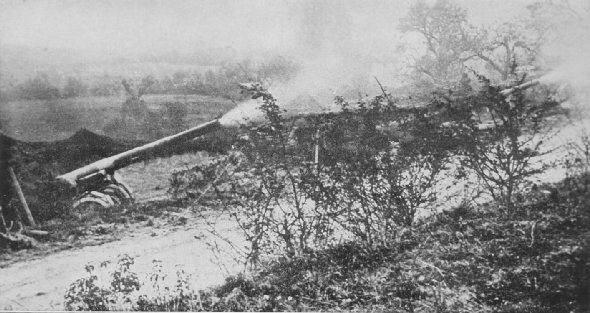 At this time the battery was at Baulny, supporting the 1st Division in its drive toward Exermont. 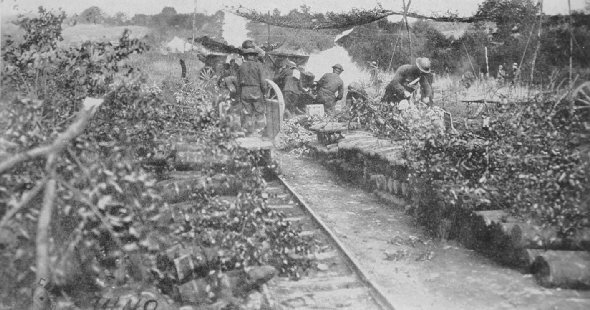 Battery A, 108th F. A., 28th Div., with a supply of camouflaged shells piled along the narrow gauge railway, near Varennes, Argonne, France. As our shells burst on the retreating columns, the scenes must have been infernal.